A brand-new meal plan that will assist readers with incorporating green smoothies into their everyday routine while developing healthier long-term eating habits and improving their overall health. 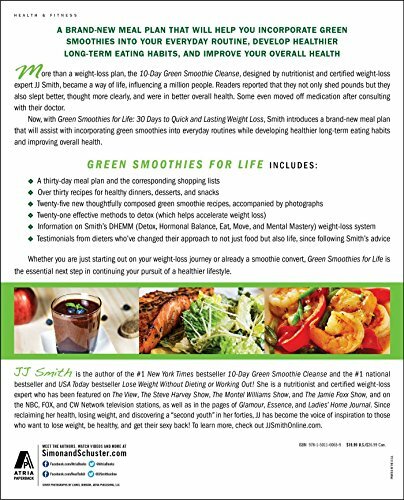 More than a weight loss plan, the 10-Day Green Smoothie Cleanse, designed by nutritionist and certified weight-loss expert JJ Smith, became a way of life. Readers reported that they not only shed pounds but they also slept better, thought more clearly, and were in better over-all health, with some adherents, in consultation with their doctor, even moving off medication. As delicious as her green smoothies are, however, the cleanse was designed only to jumpstart a detox and a new approach to eating—it’s not a permanent solution. 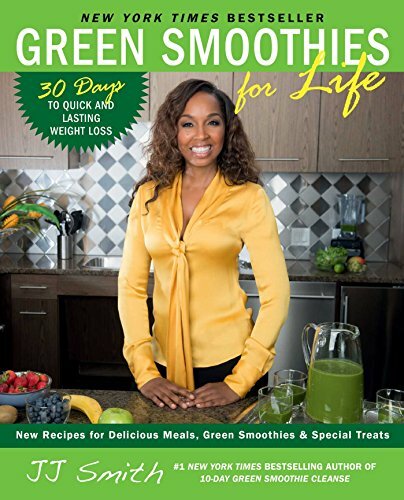 In her new book, Green Smoothies for Life, the highly anticipated follow up to the #1 New York Times bestseller 10-Day Green Smoothie Cleanse, Smith presents a way that green smoothies can be incorporated into your daily regimen. With over thirty recipes for everything from hot dinners to desserts and snacks, sixty thoughtfully composed green smoothie recipes, a thirty-day meal plan and the corresponding shopping lists, the book provides you with a step-by-step prescriptive daily regimen that shows you how to eat mindfully and healthily. In addition to green smoothies and color photographs of select recipes, the book includes more than twenty effective methods to detox (which helps fuel weight loss), information on Smith’s DHEMM (Detox, Hormonal Balance, Eat, Move and Mental Mastery) weight loss system, and testimonials from dieters who’ve change their approach to not just food but also life since while following her advice.